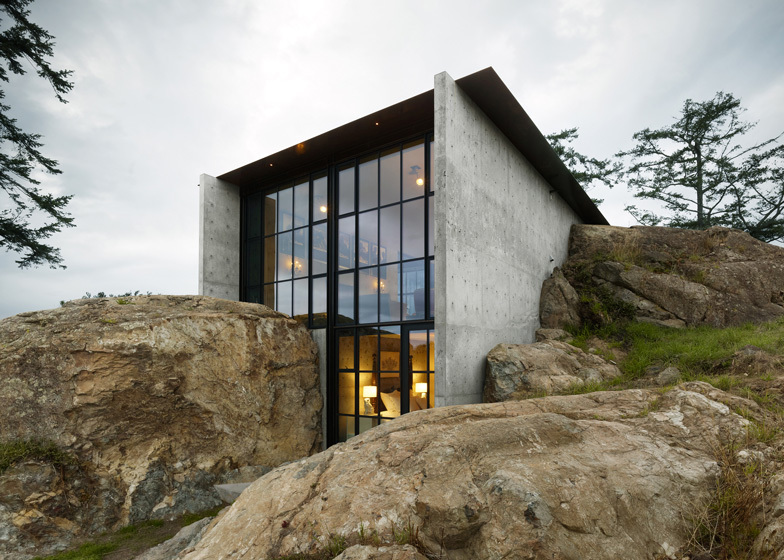 Seattle firm Olson Kundig Architects used dynamite, chippers and saws to bore through the huge boulders of a rocky outcrop on a North American island to make room for this raw concrete house (+ slideshow). 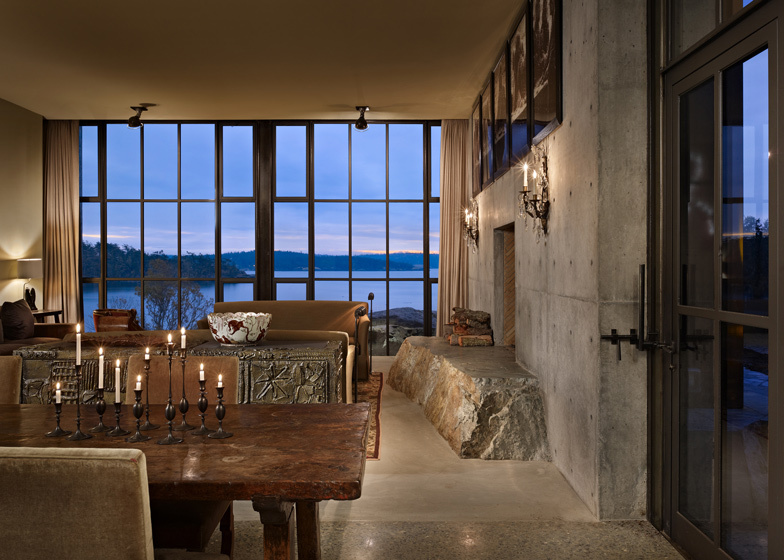 Named after the French word for stone, the Pierre is a single-storey residence designed to cut into the protruding bedrock of the client's existing property, located on one of the San Juan Islands off the coast of Seattle. 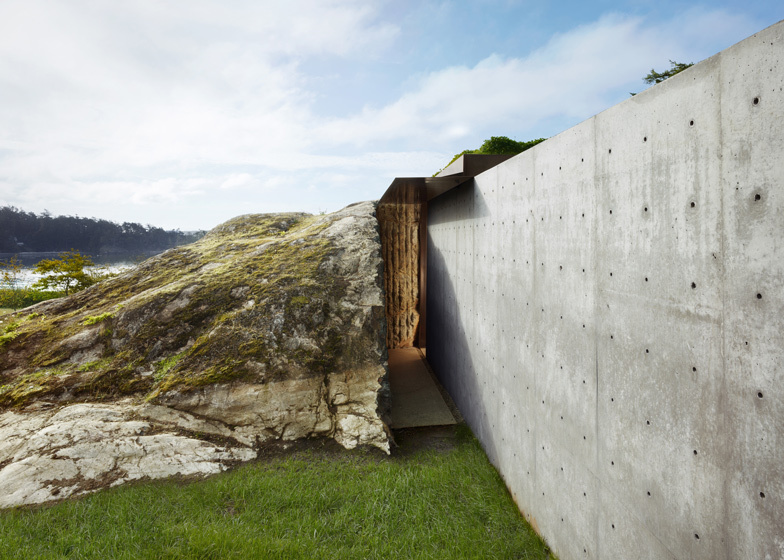 "Putting the house in the rock follows a tradition of building on the least productive part of a site, leaving the best parts free for cultivation," said Tom Kundig, a director at Olson Kundig Architects and the lead architect on the project. 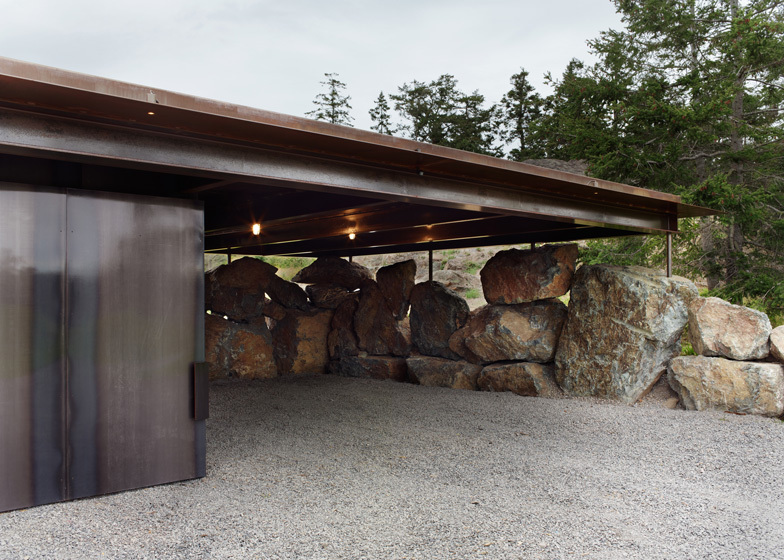 The house is slotted between two sections of rock. 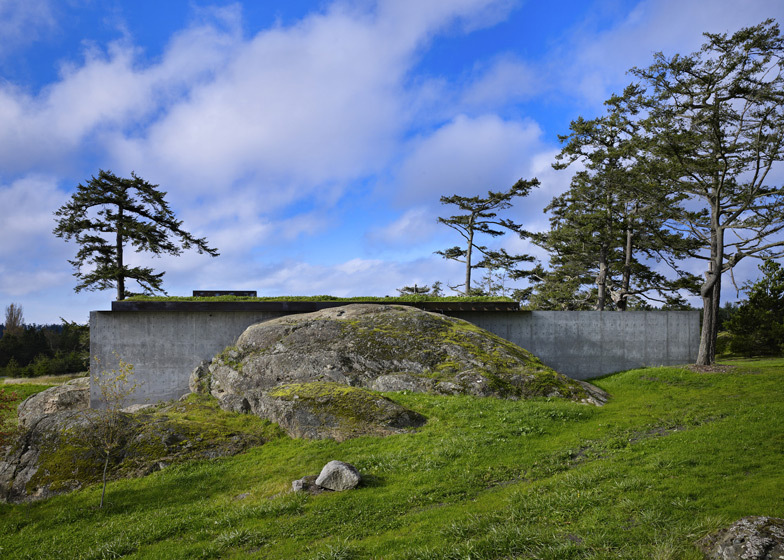 Its walls are made from exposed concrete, with a smooth surface that opposes the rough stone, while the roof is covered with grassy plants to allow the building to merge into the landscape. 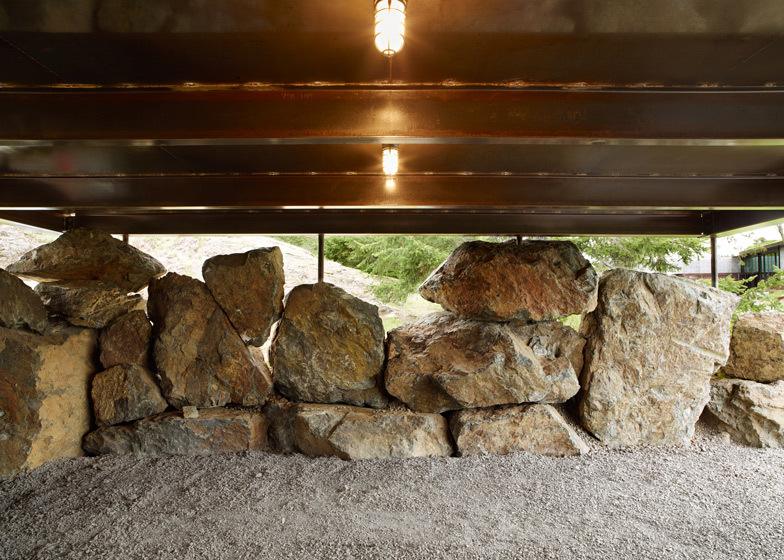 Traces of the stone continue through the house's interior, where a cave-like bathroom tunnels through one of the boulders and features a mirror that hangs down from a hole in the ceiling. A large living and dining room spans the length of the building and features a fireplace hearth comprising a carved rock with a levelled surface. The master bedroom sits off to one side and includes a sink with a basin made from another huge lump of stone, where polished sections allow water to cascade down three separate pools. All rooms of the house are furnished with a selection of antique pieces, artworks and custom-designed lighting fixtures. Leftover rock from the site excavation was turned into crushed aggregate for use during the construction. The Pierre was completed in 2010 but was named as one of 26 winners of the American Institute of Architects' Institute Honor Awards earlier this week. Photography is by Benjamin Benschneider, unless otherwise stated. The owner's affection for a stone outcropping on her property inspired the design of this house. Conceived as a retreat nestled into the rock, the Pierre (the French word for stone) celebrates the materiality of the site. From certain angles, the house - with its rough materials, encompassing stone, green roof, and surrounding foliage - almost disappears into nature. To set the house deep into the site, portions of the rock outcropping were excavated through a combination of machine work and handwork. The contractor used large drills to set the outline of the building, then used dynamite, hydraulic chippers, and wire saws and other hand tools, working with finer and finer implements as construction progressed. Excavated rock was reused as crushed aggregate in the on all the stonework, a reminder of the building process, while huge pieces of rock were employed for the carport structure. With the exception of a separate guest suite, the house functions on one main level, with an open-plan kitchen, dining, and living space. A wood-clad storage box (made with siding reclaimed from a Lionel Pries-designed house) transitions from outside to inside. Its two large bookcases open to provide concealed access to laundry and kitchen storage. A large pivoting steel and glass door provides access to a terrace. Throughout the house, the rock protrudes into the space, contrasting with the luxurious textures of the furnishings. Interior and exterior fireplace hearths are carved out of existing stone; levelled on top, they are otherwise left raw. In the master bathroom, water cascades through three polished pools, natural sinks in the existing stone. Off the main space, a powder room is carved out of the rock; a mirror set within a skytube reflects natural light into the space. 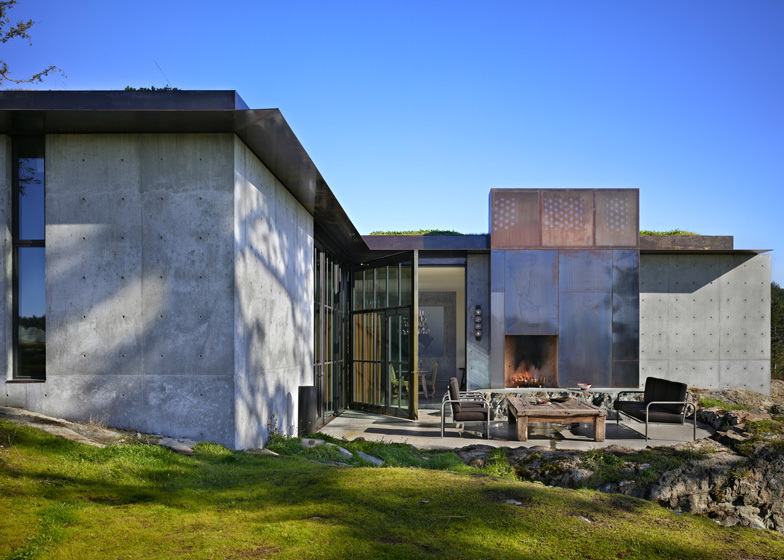 The materiality of the built structure - mild steel, smooth concrete, and drywall - create a neutral backdrop for the interior furnishings and artwork and the exterior views to the bay and surrounding landscape. Contemporary works of art by Cameron Martin, Jesse Paul Miller, Andres Serrano, Franz West, and Claude Zervas are mounted inside and outside the house. Antique furniture and art objects are complemented by custom pieces. The custom light fixtures are based on the designs of Irene McGowan, a Seattle artist and lighting designer best known for her work with noted Northwest architect Roland Terry.